Helllllo Qwearlings! 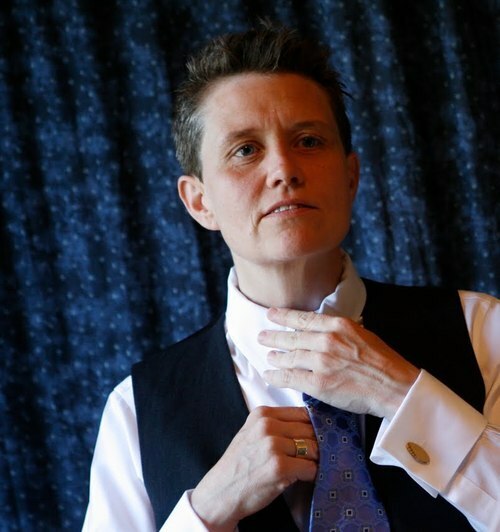 Many of you may have already jumped on the Saint Harridan bandwagon, but for those who are new to the world of fashion boihood, Saint Harridan is a growing company that intends to make suits for women/butches/bois/transmen/etc. Rather than custom-making each suit like many queer companies, they on mass producing them and make them more affordable and accessible. If all works out according to plan, every Joe queer and their boyfriend will be filling the streets and offices in amazingly tailored suits. I had some additional questions for Saint Harridan, so I decided to interview their founder, Mary Going, and get more scoop on the suit construction, the growth of her business, and how we can help get those suits on the shelves. In your latest blog entry, you discussed the elements of a great suit for a Saint’s body. How do you intend on working around curves for a perfectly fitted suit jacket with no darts? What I mean by “no extra darts:” Men’s suits are designed to protect the body. They have an outer layer, an inner lining; and between those two layers, in the chest area, a third layer which is actually called “armor.” They are designed as if going into battle. It’s not about the body; it’s about the man. Our suits are built to make the suit about the wearer and not about their body. We are not anti-breasts or anti-hips; we are simply designing so that the wearer can step into the power of their body. And, what plans do you have for creating trousers for people with hips? Similarly, the trousers are designed to allow the wearer to move and function. The pants will have functional pockets, will not highlight hips or curves, and will be designed so that if you gain or lose a few pounds, you can alter them. Rather than giving them away, or having them sit in the “someday” section of your closet. How are the suits going to be constructed? You’ve also discussed investors not believing that you’d have enough customers to be a successful business. What are 5 things we can do to show that we exist and help Saint Harridan get started? 1. Buy a suit! Or, buy just the trousers, shirt or jacket. 2. If a suit is out of your price range, pledge a smaller amount of money and get a tee shirt, tie, tie clip or any number of other great rewards. 3. Post the Kickstarter campaign on your Facebook page, Tumblr site, etc. 4. Personally email everyone you know who might remotely be interested in this idea. 5. Post to every queer/trans/butch/stud email list or web site you can think of. Thank you! These five things will help us tremendously. Lots of people say to me “it’s finally time somebody did this.” And, I’m SO excited to do it. Manufacturing a clothing line requires a good bit of money. For example, it costs about $12,000 to develop a suit from scratch — just to get it ready to produce. Imagine if you add a sweater (or 3! ), a vest, shoes, many different cuts of the suit, etc. This adds up pretty quickly, and we still haven’t actually produced anything — we’ve just gotten to the “ready” phase. What kinds of suit customizations are you planning on offering? 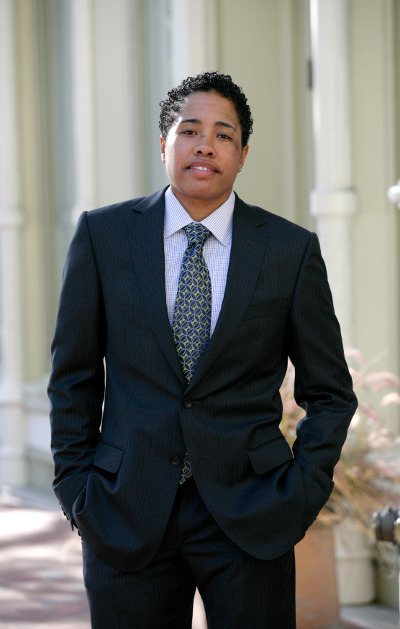 It’s important to me that Saint Harridan provide suits for a wide range of sizes. I naively thought when I first started this project that there were standard sizes, and I’d do the whole range, making sure to have every size. What I’ve learned, though, is that there are 6 billion people on our planet, and therefore 6 billion different body shapes. No two bodies are alike. We will offer a wide range of sizes — but for some people, their suits will need a bit of tweaking in order to fit perfectly. We can do that tweaking for them, or help them find a tailor in their area who can do it for them. Will you be designing suits for every model? And will the winners get to keep the suits? Models in the pop-up stores will be modeling the ready-to-wear/off-the-rack suits that we’re producing. Each model will get Saint Harridan schwag, discounts on all our merchandise, entry into the fashion shows (or perhaps the chance to be IN the fashion show) and professional (digital) photographs of themselves modeling the suits. Sonny says: p.s. While I was working on this interview post in a cafe, the guy next to me glanced at my screen and mentioned that his girlfriend wants to buy one of their suits. Woordd!! !